Chairman of Birmingham’s Guru Nanak Nishkam Sewak Jatha (GNNSJ) and NCA, Bhai Sahib Dr Mohinder Singh was invited to the New North London Synagogue in Finchley to partake in a roundtable interfaith discussion. The event, which was about what we are doing here on earth, with four speakers renowned for their faith-inspired work, attracted enormous interest within the local Jewish community. 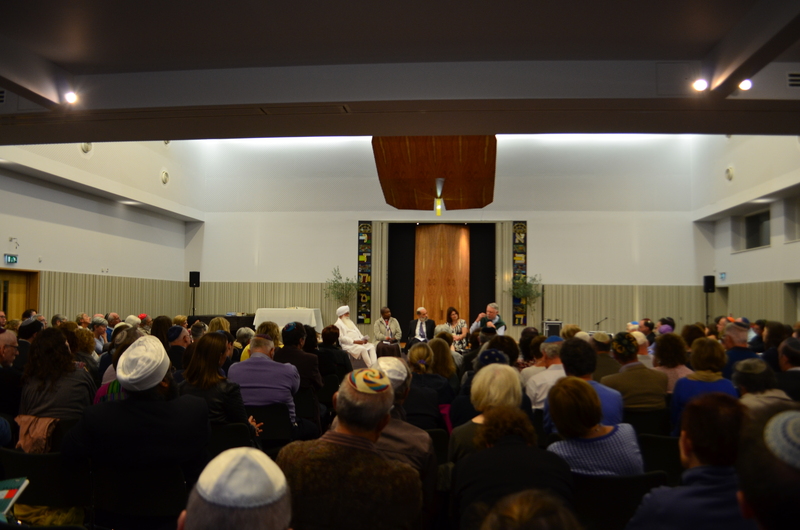 On Sunday 8th September 2013, the New North London Synagogue in Finchley hosted an evening of interfaith reflections shared by four leading figures from the Jewish, Christian and Sikh faith traditions. Invited to participate alongside Bhai Sahib were: Rabbi Shoshana Boyd-Gelfand, Director of JHub, supporting charities in the areas of social action and innovation, Reverend Rose Hudson-Wilkins, 79th Chaplain to the Speaker of the House of Commons and Terry Waite, former special envoy for the Church of England whose work in negotiating the release of hostages led to his own captivity in Beirut for over four years. The event organised and led by Rabbi Jonathan Wittenburg, attracted a large audience of about 150-200 people, largely from the synagogue community. Falling between the Jewish New Year and Day of Atonement and finishing with a Penitential Service, the discussion sought to draw out reflections from the panel on the ‘biggest and deepest questions’ of human existence and their journey of faith. The speakers moved from sharing their experiences of childhood and considering the formative, grassroots factors which had inspired their life of faith, to discussing the transformative power and practical application of faith-based values. Revd Rose Hudson-Wilkins recounted her inner calling to serve as a youngster in her early teens and as well as some of the challenges she has confronted as a female faith leader. Born in Jamaica, she was raised without her mother but within a family setting. Recalling these times she observed that her faith was not ‘learned’ as such through theological training, but inspired and absorbed through seeing it lived out through people around her as she grew up, for example, through their trust that ‘God would provide’ in times when food and money were scarce. Bhai Sahib shared with the audience the loss of his own mother when he was a very young child, describing how this set him on a journey of inner questioning about the meaning and purpose of life, leading him to explore and practice the Sikh faith he was born into. He described the link between the concepts of faith, trust and hope and stressed the Sikh teaching that compassion is the essential bedrock of faith. Remarking that forgiveness is the action which emanates from compassion, he observed, to the positive murmurs of the audience, that only mothers seem to share with God the ability to absolutely forgive and that it is a phenomenon we should all learn from. He explained that the Sikh word for faith – dharam – had the connotation of love and service, with a sense of responsibility to both God and all elements of creation, where our interconnectedness and interdependence is deeply valued and none is a stranger or foe. Terry Waite reflected on the deep learning arising from his first-hand experiences, both in captivity itself and in his act of revisiting and engaging with his captors to secure the safety and freedom of others. He described how the quiet application of faith-inspired values made the ultimate difference in drawing out another’s humanity. He presented faith as a way of being that was internalised through the values by which one thinks and acts, reiterating the importance of a ‘living’ faith which is found beyond the ritual and dogma of religion. The other speakers strongly resonated with this. Rabbi Shoshana Boyd-Gelfand reflected on the creative, personal and social dimensions of faith practice and commitment. She described how music and the natural world, beyond conventional prayer or places of worship, were important elements for her personally of faith practice. She suggested the value of social projects that sets themselves in the far wider context of being ‘God-centred’ rather than centred in the individual alone. He went on, “My tradition informs me, Sach kaho sun leho sabai, jin prem kiyo tin hi prabh payo… Hear ye all this truth; only those exercising love towards all, will meet God. Furthermore, we must recognise all humanity as one – there should be no distinction between friend or foe”. 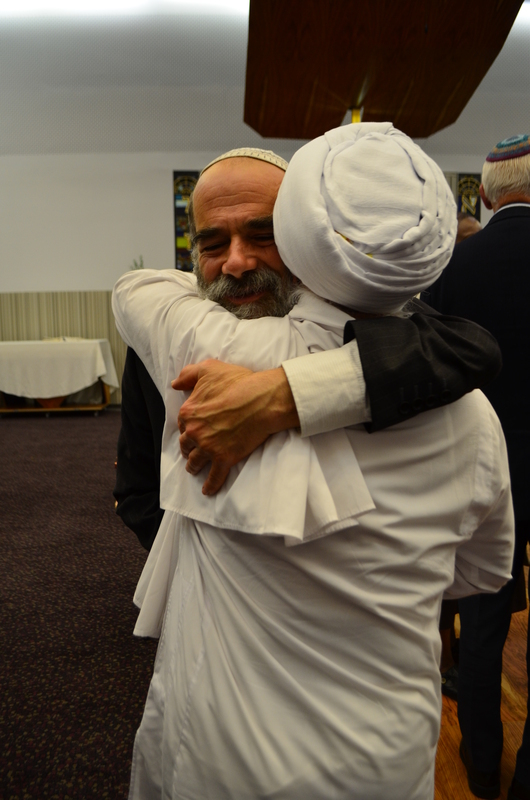 Rabbi Jonathan Wittenburg presented Bhai Sahib with two books and a CD before they gave each other a hug as a token of warm mutual affection.